Pilates is an exercise system that was developed by Joseph Pilates in the early 20th century. Pilates incorporates the use of the breath to facilitate optimal bodily movement initiated from the “core” musculature. The movement is taught and learned utilizing special Pilates apparatus including the Reformer, the Cadilllac, the Wunda chair, the Ladder barrel, and the Spine corrector. Each apparatus is unique in helping you develop muscle tone, core stability, and muscle lengthening. The spring loaded, progressive resistances on the Cadillac and Reformer assist you in developing muscle strength while the moving carriage on the Reformer enhances your balance and body awareness. The Pilates method facilitates muscle toning and lengthening which increases muscle flexibility and strength simultaneously. This allows you to improve your posture, body awareness, and physical mobility. We, at Core Physical Therapy & Performance, are staffed with BASI (Body Arts and Science Institute) Pilates instructors who have the training and understanding necessary to help you find your inner “core.” One hour Mat Pilates classes are offered on a weekly basis. 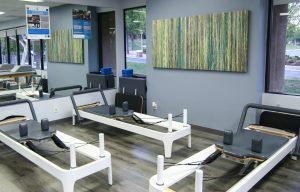 Reformer classes are also available on a 2-on-1 or 1-on-1 basis where a total body workout is integrated with a focus on core stabilization and personalized to address your body’s needs.